Dry Pipe Systems hold compressed air in all the lines, water is held back at the valve by the compressed air. 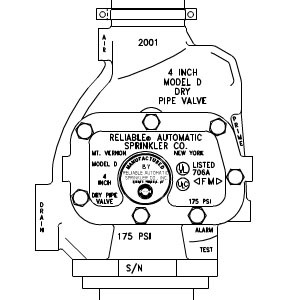 When a sprinkler head is triggered by heat, the compressed air in the lines is allowed to escape, causing the valve to open and flood the lines with water. Dry Pipe Systems are typically found in areas prone to freezing, such as parking garages and storage facilities. They consist of Tamper, Waterflow and Pressure Switches monitored by a Fire Alarm/ Sprinkler Monitoring panel.